I made some taro dessert (Or Nee / 芋泥) tonight. In Malaysia, Or Nee / 芋泥 is usually served plain. Sometimes, it’s topped with fried shallots while others come with gingko nuts. I topped mine with some ground peanuts (for both aesthetic and flavor purposes). If you would like to get a creamier, richer, and melt-in-your-mouth texture, then by all means, you should use lard instead of cooking oil. 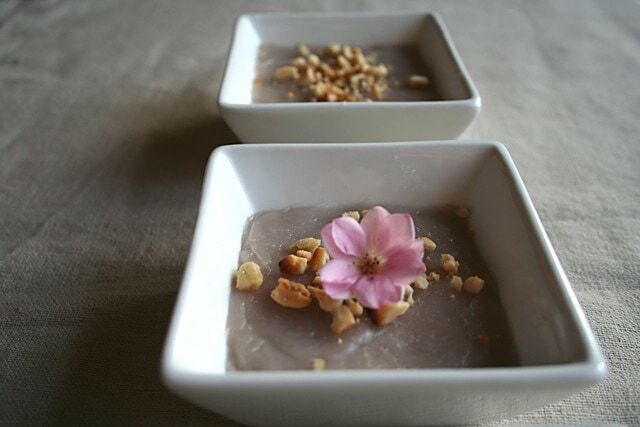 Spring is finally here, so go to your garden and pluck off a flower or two and garnish your taro pudding. Now, just sit back and enjoy this pleasing dessert. Note: Taro is also called Yam. Bring a small pot of water to boil and add the taro pieces and boil for 10 minutes or until the taro pieces are thoroughly cooked. Drain the water and set aside the taro and let cool. Use a masher or a big spoon to mash the taro until they are completely well-mashed. Heat up a wok and pour in the cooking oil. Add in the mashed taro and continue to stir until the oil and taro are blended. Keep the heat low and continue to stir for 10 minutes until the taro paste becomes gooey and smooth. Add the sugar and stir for another couple of minutes. Dish up and garnish with ground peanut. Serve warm. Unka, I took those pictures like at 6 pm, with very little sunset light…maybe that’s why. If I were to take them with plenty of sun, I think they will turn out better. U must me a very good cook cos this is the first time I heard someone say or nee is easy to make. Can’t wait to read ur recipe soon. Other than the camera, gotta have those nice serving bowls and that spring flower to make everything so pleasant :D I like everything about it (including the Or Nee, of course!) It’s so pleasing to the eye…the hint of pink (flower), greyish-purple(or nee) and the light-greyish(table mat)! Nice. If I may, I think the pictures came out a bit too dark. I try to take food shot either near the window or have reflected lights. Try it, and you’ll like it. You might also want to experiment with different apertures to bring the target spot into clearer focus. Are these shots taken hand held? Is this dessert to be eat hot? I tried Yam pudding with gingko at a Taiwanese restaurant before. The pink flower look very nice….spring….ahh…best season of the year! hmmm, i really have to start saving for a new camera. pics are even more gorgeous than before, if at all possible, though yar, a bit dark. i thought your hubby said all the pics are usually taken before 3pm, which is the time he’s allowed to eat…. I anyhow humtum and made OrNee before and it turned out a bit wierd, so I hope to see your recipe soon! Looks fantastic…must make time to give it a go! Unka – you have a kitchen in BKK? You can whip this up so easily. Just follow my recipe. Tiga – thanks for your encouraging words. I feel like my investment is justified…muahahahah. PP – I like this dessert warm…I don’t know, I just dont’ like cold stuff. Yes, some Or Nee is served with gingko nuts. Simcooks – really? I will go check your recipe. Try mine next time? I think the pictures look quite crisp for the light that you used them in. If I took those same pictures with my camera, they’d be completely blurry and pixelated. I can’t wait to experiment more with your new camera! And when I say “experiment,” I mean for me to see more pictures and read more recipes! 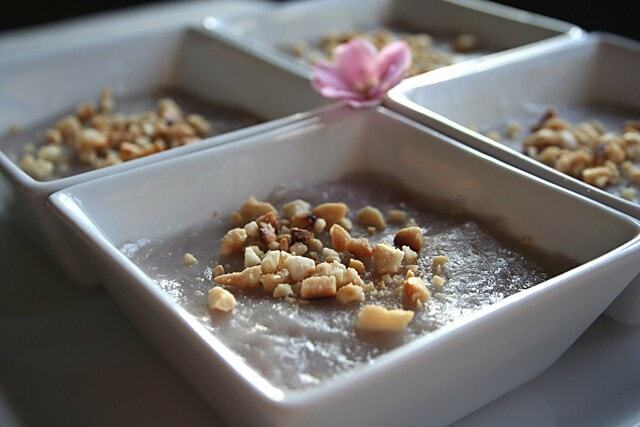 :) I love the flower you put in the middle of the taro pudding dishes, and the taro pudding looks so creamy and divine. Thanks for inspiring me to cook more Bee! My husband and I love this ornee dessert. I must surprise him one day with your recipe. The one I have eaten in KL, they top it with ginko. Btw, very nice serving bowls! Love them. try adding shallots into your ornee. fry them in as much oil as you would use for your ornee and after it has turned golden brown, add ornee to it and cook as usual. YUM! We order this at Teochew (aka Chiu Chow) restaurants in HK. 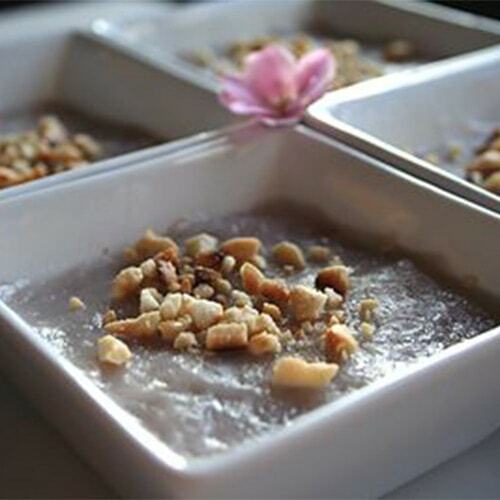 Here they serve it with boiled ginko nuts which adds a chewy aspect to the whole dessert. Finally, an easy recipe for my all time favorite dessert! I am Teochew … it’s in my BLOOD to LOVE THIS DESSERT!!! LOL!!! i saw on top chef if you don’t cook taro right you get an itchy throat! :D hehe i’m sure you saw it too. i love taro. I din post my recipe. I just made it after Melting Wok made her dessert (the one with the mung beans and taro) and she (or was it you?) gave some tips in her comments after I asked how to make sticky Or Nee. So I just anyhow humtum. I either over-steamed it or added too much coconut milk. I’ll give your listed method a shot! Thanks! Sori – I meant to say I need detailed instructions when I try a new recipe that’s why my first attempt did not work out ! I steamed (not boil) the taro and I did not add oil. I did add sugar and coconut milk. Ho Jiak – yes, I sent you an email from Rasa Malaysia. Please check. Tricia Lee-Chin – LOL. Great that you are Teochew and love this dessert. I think Teochew food is great…especially the seafood. Mmm! Budding Cook – correct…some of the taro is very sticky and that sticky thingy that makes your throat itchy. I miss Top Chef. Made this today, and it was very good. Thanks for the recipe! hi, tis amt can serve how many people ah? i wanted to make for my bf. he loves or nee. I used your taro dessert recipe and my kids just love them. 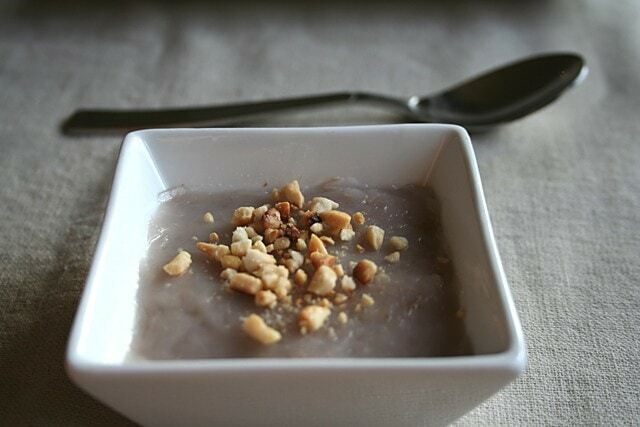 and now i have to keep making this taro dessert for my kids. Anyone knows how long or nee can last without refridgeration? Also how with refridgeration? Thanks! Taro is another name for yam. Hawaiians call yam taro. Sweet potato is from an entirely different plant species from yam. Go check Wikipedia for these 2 items.